One quality that sets the 2018 Hyundai Santa Fe apart is its versatility. It’s great for driving around town all week and even better for driving far away on the weekend. With 160 cubic feet of total interior volume, it offers more space than the Toyota Highlander, Dodge Durango and Mazda CX-9. Fold down the second and third rows of seating for a maximum of 80 cu. ft. of cargo capacity, or leave the seats up for spacious seating for 7. With 146.6 cu. ft. of passenger volume, everyone can come for a ride. For extra cargo capability, the new Hyundai Santa Fe in Reno also offers standard roof rack side rails, as well as available roof rack cross rails. Drive an SUV that’s compatible with your lifestyle. Visit Lithia Hyundai of Reno today and test drive the 2018 Hyundai Santa Fe. If you’re looking for a new family SUV, only the safest vehicles should make the cut. As a 2018 IIHS Top Safety Pick +, with an NHTSA 5-Star Overall Safety Rating, the 2018 Hyundai Santa Fe has the safety technology you want. Available cutting-edge features, such as Automatic Emergency Braking with Pedestrian Detection, Blind Spot Detection with Rear Cross-Traffic Alert and Lane Departure Warning offer a sixth sense every time you’re on the road. The new Hyundai Santa Fe also offers a standard rearview camera, as well as Vehicle Stability Management, Electronic Stability Control and a Traction Control System. Give your loved ones the best. Drive home in a 2018 Hyundai Santa Fe from Lithia Hyundai of Reno today. The new Hyundai Santa Fe isn’t just built for the open road, it’s built to stay on the road longer. Skip the next couple of pumps with its efficient 3.3L GDI DOHC 24-valve V6. With a standard engine that gets an EPA-estimated 25 highway MPG, it’s equipped to keep you moving. Visit Lithia Hyundai of Reno today and test drive the 2018 Hyundai Santa Fe. The 2018 Hyundai Santa Fe is a modern SUV for a modern family, offering an interior full of all the latest high-tech toys. Android Auto™ and Apple CarPlay™ come standard, along with a 7-inch display, giving you access to all your contacts, music and mobile apps. You’ll also have access to a standard Bluetooth® hands-free phone system, so you can always keep your hands on the wheel. The new Hyundai Santa Fe is music friendly as well, with standard HD Radio™ technology with multicasting, and SiriusXM® and MP3 audio capability. Crank up the quality with available Infinity® Premium Audio with Quantum Logic® Surround and Clari-Fi™ Music Restoration Technology. Drivers in Reno, Sparks and Carson City, NV – your search is over. 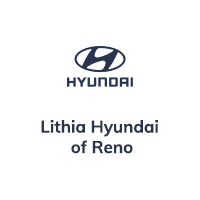 Check out the 2018 Hyundai Santa Fe at Lithia Hyundai of Reno today!